Red & Blue Design Hotel Prague Distance to the centre of town 2.6 km price per day from €55 The new Red & Blue Design Hotel Prague is situated opposite the Petrin Park close to the very heart of the city, a short walk from Charles Bridge and Prague Castle. Wireless internet is available in the entire Red & Blue Design hotel free of charge. The rooms are quiet and most of them face the park. They include tea and coffee facilities, a laptop-size safe and a TV with a disk slot, allowing you to watch your videos and pictures from the day, or films you brought with you. Silenzio Distance to the centre of town 4.9 km price per day from €62 Hotel Silenzio enjoys a peaceful location in Prague's green Hanspaulka district, a 5-minute metro ride to the Old Town Square and 10-minute tram ride to Prague Castle. It offers free WiFi and free private parking. The Dejvická Metro Stop is 900 metres away and the Thákurova Tram Station is 300 metres from the Silenzio. Václav Havel Airport is accessible within a 20-minute bus ride. All rooms in the non-smoking Silenzio Hotel are air conditioned and elegantly furnished and feature a satellite TV. 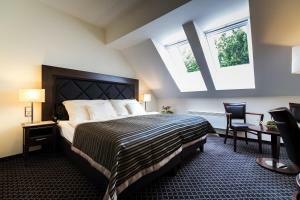 Park Inn Hotel Prague Distance to the centre of town 1.6 km price per day from €45 Originally built in 1907, Park Inn Hotel is located in Prague’s scenic second district, just a short distance from the Vltava River and Vysehrad Castle. 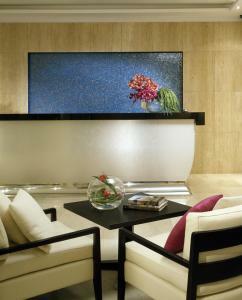 All rooms feature individually adjustable air-conditioning and flat-screen satellite TVs. The rooftop fitness centre at the Park Inn Hotel Prague can be used free of charge. All important sights can be easily reached on foot or by public transport. K+K Hotel Fenix Distance to the centre of town 0.9 km price per day from €70 Located In the very heart of Prague, just a few steps from the famous Wenceslas Square, the hotel’s imposing building is a remarkable architectural landmark. The hotel is close to Prague’s beautiful, historic Old Town and all of its magnificent sights, fascinating museums, wonderful shops and great restaurants. As with all K+K hotels, the first-class Hotel Fenix offers state-of-the-art amenities, great business facilities and elegantly furnished rooms. Hotel Selsky Dvur - Bohemian Village Courtyard Distance to the centre of town 6.9 km price per day from €45 Renovated in summer 2013, Hotel Selsky Dvur - Bohemian Village Courtyard is located in a quiet district of Prague, a 30-minute ride by public transport from the centre. It offers fully en-suite rooms with a minibar, a charming courtyard and a spa area. A bus stop is located right in front of the building and the Hostivar Shopping Centre is only 1 km away. The farm-style Selsky Dvur hotel is a listed monument built around a charming green courtyard with a mill wheel and the restaurant's terrace. Design Merrion Hotel Distance to the centre of town 2.2 km price per day from €55 Set between the large Vitkov and Parukarka parks, the Design Merrion Hotel is only a 10-minute bus ride from Prague's centre. It offers stylish, air-conditioned rooms with free wired internet. All rooms in the Design Hotel Merrion feature Italian designer furniture, a flat-screen satellite TV with Pay TV channels, a laptop-size safe and a luxurious bathroom. A buffet breakfast is served in the winter garden and the elegant bar offers a wide range of drinks. The Charles Distance to the centre of town 2.7 km price per day from €40 The air-conditioned Charles hotel enjoys a central location in Lesser Town, 100 metres from Charles Bridge and a 15-minute walk from Prague Castle. It offers a free internet station and free Wi-Fi. This historic building with Baroque-style furniture and wooden beamed ceilings dates back to 1857 and is fully air-conditioned. 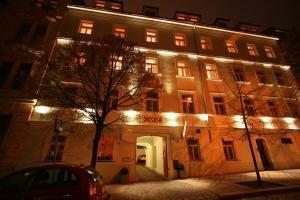 All rooms of the Charles Hotel Prague have a private bathroom with shower or bathtub. Hotel Askania Distance to the centre of town 1.5 km price per day from €30 Hotel Askania is located less than 3 km from Prague city centre. All rooms are equipped with a work desk, a minibar and satellite TV. Guests of the hotel can relax in the spa centre or enjoy a game of billiards, at a surcharge. 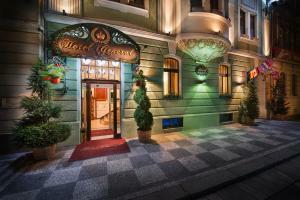 The hotel is 180 metres from the Nuselská Radnice tram stop, and 14 km from Ruzyně International Airport. An airport transfer shuttle service is available on request. Hotel Taurus Distance to the centre of town 1.1 km price per day from €25 Set in the Vinohrady quarter of Prague, Hotel Taurus offers en-suite rooms 1 km from Wenceslas Square. The nearest metro stop, Jiriho z Podebrad, is 100 metres away. All rooms at Hotel Taurus have an LCD satellite TV, free Wi-Fi, minibar, a safe and a hairdryer. Guests can also visit the New Jewish Cemetery with the burial place of the writer Franz Kafka. Hotel Voyage Distance to the centre of town 2 km price per day from €50 Set in Prague's dynamic Žižkov district, Hotel Voyage is surrounded by fashionable cafés, pubs and bars. The property offers elegantly decorated rooms and free Wi-Fi. The comfortable rooms with carpeted floors and matching curtains offer an LCD satellite TV. The spacious private bathroom comes with shower and hairdryer. The city centre and the Wenceslas Square can be reached in 10 minutes by tram.